Conseil & Recherche recently draw a map of the dozen of the corporate FabLabs impleted in France. 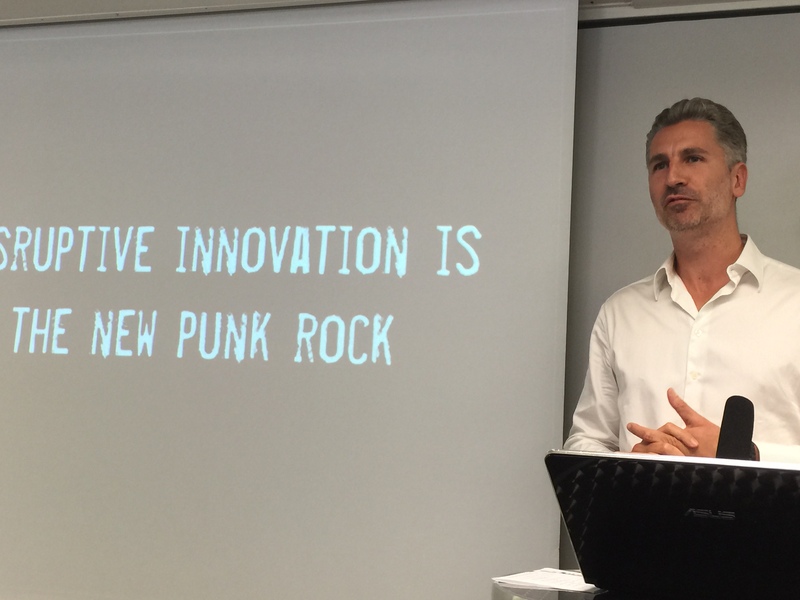 This week, Marc Giget invited some corporate FabLabs creators to present at Paris Association of Innovation Managers: through their meaningful story, we realize how FabLabs, beyond manufacturing tools, are extensive and sparkling innovation spaces. Marc first explains the East-Coast origin of the FabLab with the MIT branding. There are around 437 FabLabs, and 240 are located in Europe. If Maker movement is on the rise in the US, Europe holds leadership on industrial FabLabs. 14 French corporate FabLabs have just joined in an association named Fab&Co. Frédéric Vacher is Director Strategy Innovation at Dassault Systemes, and Head of the FabLab. Dassault Systemes 3D Design is directly linked to 3d Printing, and personal manufacturing is foreseen as personal computing wave. 3DS FabLab initiative started 3 years ago, hacking an open space on the campus, further opened to the outside. It was designed to unleash creativity, with a corresponding community on a social platform to share one’s project, get challenged, receive support, and expose it outside of the campus boundaries, at international scale. 13 000 Dassault Systems employees are invited to connect, as well as 200 000 designers from all around the world. MADEin3D™ International challenges are set-up on the online social platform. The 3DS FabLab is a way to spot talents, and help young people to make their dream come true: successful examples are a creative drone design, bio mimicry lamps, iphone covers…check this 2014 best off in video. It fosters collective intelligence and social link, both across generations, and between professionals and amateurs. It entailed the creation of an accelerator to follow-up on the best projects: thus Love by me is an online offering to customize, and 3D print your jewel. The service is delivered with Intermarché and Sculpteo, and it was scouted on the platform: Dassault helped to reach the industrialization stage. Ideation & Design activities come in addition to Prototyping in the FabLab. Access to manufacturing tool is very important for employees. A dedicated team composed of design engineers, design experts, and system experts, support the activities. 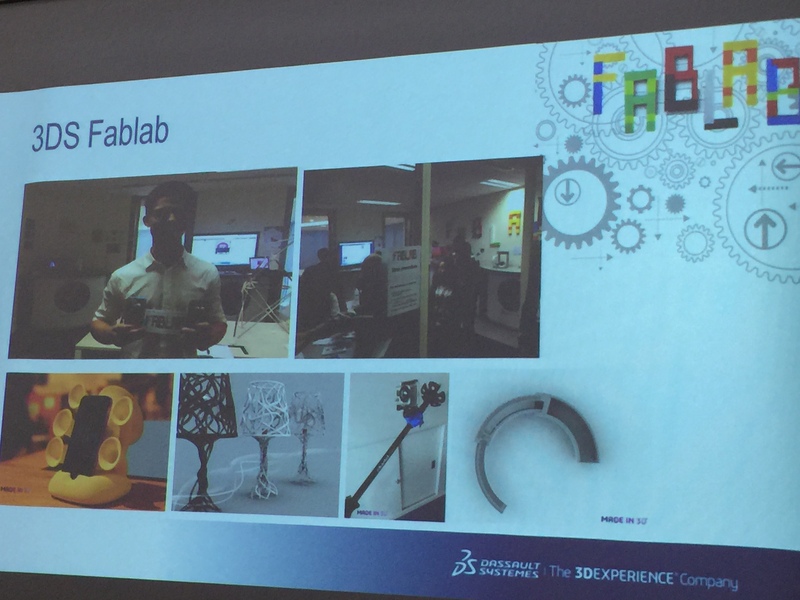 3DS Fablab has an impact on Dassault Systemes open innovation which is adapting its software offering accordingly to the audience insights. It’s a source to encompass modern constraints, and innovative design possibilities, like generative design from specifications and simulation or biomimicry. Vincent Loubière is Lead Technologist in the Emerging Technologies and Concepts team at Airbus, Founder and Leader of Airbus ProtoSpace. 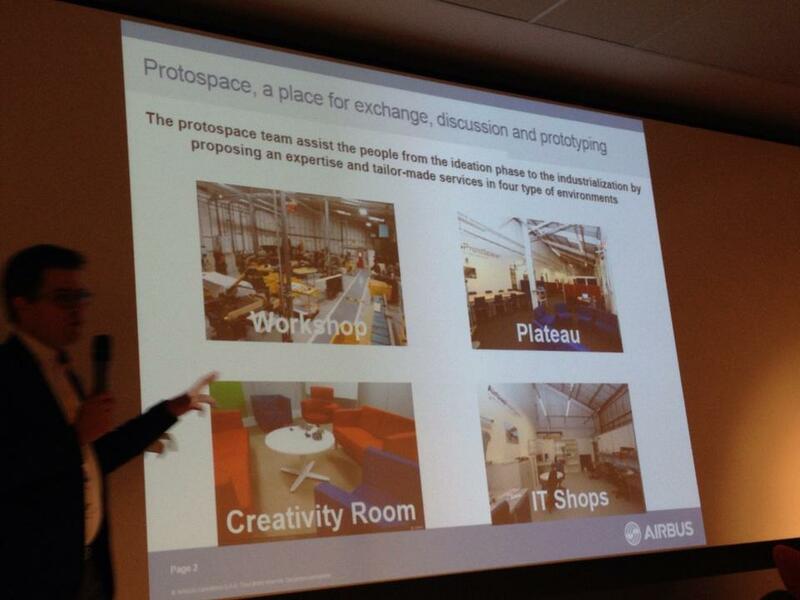 The ‘reason why’ for Airbus FabLab lies in the Uberisation threat. Software and Hardware frontiers are blurring: better than trying to block, one has to run at the same speed or faster than the Digital companies. Airbus empire can be disrupted: Google and SpaceX (founded in 2002 by Elon Musk) tackle the rocket domain. 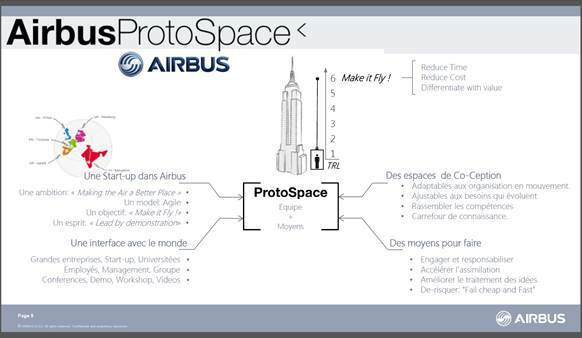 Protospace opens a new path for innovation: in parallel to traditional stage-gate process (TRL at Airbus), Protospace aims at reaching straightforward the ultimate stage. Another motivation is to build a zone where ideas are assessed on facts, creative projects can be derisked, and failure is allowed. ‘Lead by Demonstration‘ is the Protospace mantra. A dedicated team was necessary for the implementation. It provides to all employees (and beyond) a set of adaptive environments, and tools, and helps materialize emerging concepts. Methodologies rely on skunk works/Scaled composite, and collocating design and prototyping, resulting for example in a new type of chip extractor, a prototype 3D printed locally, and further industrialized with the help of a partner. Implementation was conducted in a start-up mode, at international scale: Protospace is an interface with the world. Projects are shared on an internal social network, and sites are aligned through regular videocalls. External companies are welcomed to propose collaboration, some are already engaged in. 5000 people have been involved, giving birth to 500 projects, over 5 sites, since 2013. Successful initiatives include a solution for easy-installation of airplane seats, right-on time process for sharklets manufacturing, and an inspection drone. Maybe will Protospace open its doors to customers in the future, as GE shows the way with its Power Equipment open innovation factory, recently set-up in Poland, and inviting customers to test new prototypes? From ideation to workshop, entrepreneurial momentum are supported, and there is also creativity in the assistance provided: next will be a studio to prepare innovators to pitches! Jean-Christophe Simon is Senior Vice-President Chief Innovation Officer at Groupe SEB. The concept behind Seb Lab is to cross ‘bottom-up’ with ‘top-down’ contributions. 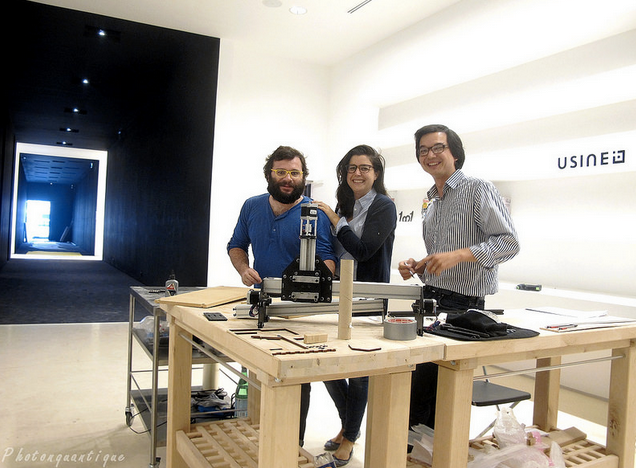 It’s a custom-made lab, combining FabLab and Design Thinking, to do it in the ‘Seb way’. 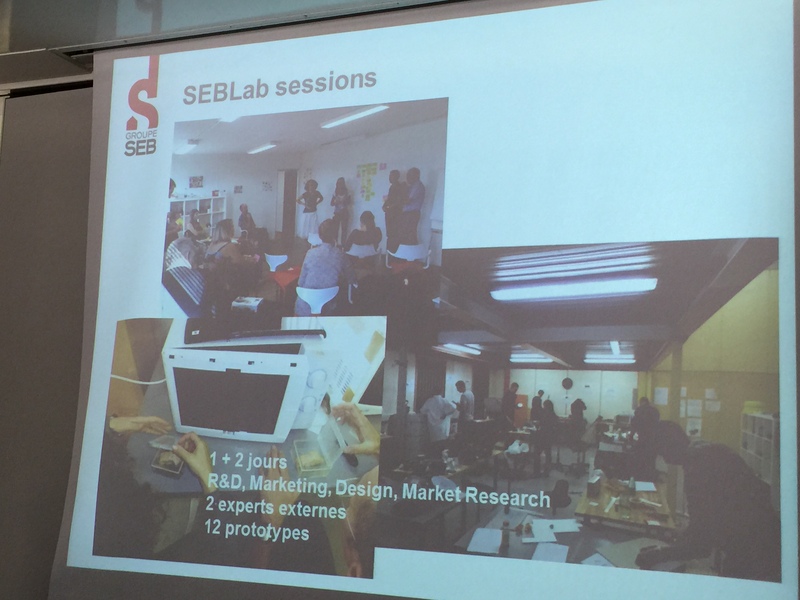 Seb Lab combines several modules: Prospection, Creativity, Materialisation, and Test. One can pick-up the module he needs. The process guides participants from concepts to materialisation. It starts with a thorough review of the business units needs, collecting additional data, and aligning vocabulary, knowledge, and expectations. Then, creativity phase is handled in one place, in one day time, with all necessary skills. The way creativity phase is carefully prepared holds the secret for success. Finally, after a pause, materialisation phase lasts 2 days. 3 people are handling the Seb Lab activities. Yearly plan of a dozen of sessions is almost full. A new FabLab in self-service mode is under construction. Open sessions with industrial partners are being evaluated as well. Seb Lab doesn’t take the place of the traditional innovation process: it opens a new path, allowing to fail fast, reinforcing preliminary convictions, or killing long-running story. Seb CEO paid a visit to Seb Lab, captured the complementarity, and encouraged everyone to participate. Seb Lab has a fantastic impact on human resources, and stands as a an unforgettable memory for the fellow teams. Something ‘Useful, usable, and desirable‘ likes to point out Fabrice Poussière. Service Innovation Factory FabLab contributes to breathe a culture of service, digital, innovation, and agility in a hardware manufacturing environment. It started in 2012, with the goal to welcome every employee’s ideas. To achieve this, the Fablab, with the help of start-up Aktan, set up a complete approach to turn idea into business, from ideation, to prototyping, experimenting, and testing the concept in customer’s hands. Managers are part of the ecosytem: the idea has to get their buy-in just like from any other partner of the ecosystem. 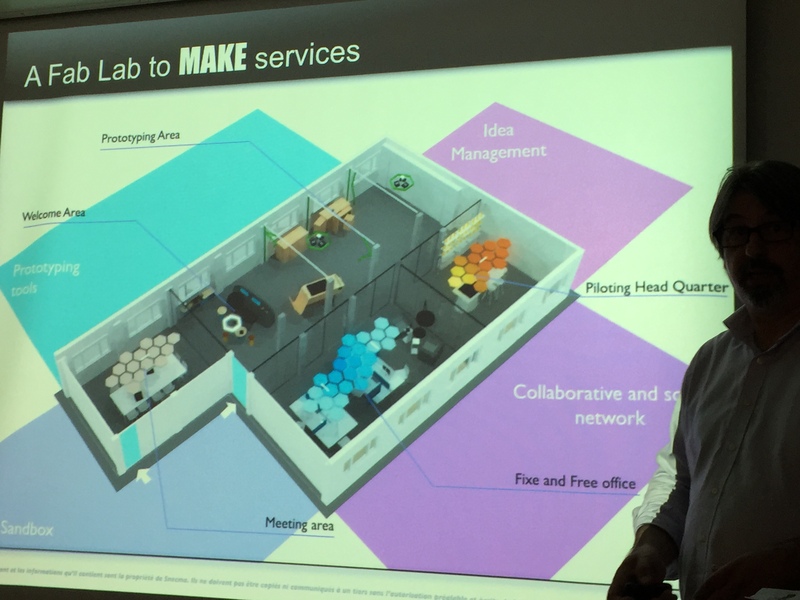 Service Innovation Factory FabLab is structured in separate spaces: a ‘meeting area’ to welcome start-ups from the outside world, a ‘welcome area’ to greet newcomers with creative ideas, ‘prototyping area’, ‘fixed and free offices’, and ‘piloting headquarters’. A particular support is provided in turning the idea into a visual storyboard, or mockups, using Persona to embody customer profiles: they are tailor-made, and designed to nail the point, and unlock investment. 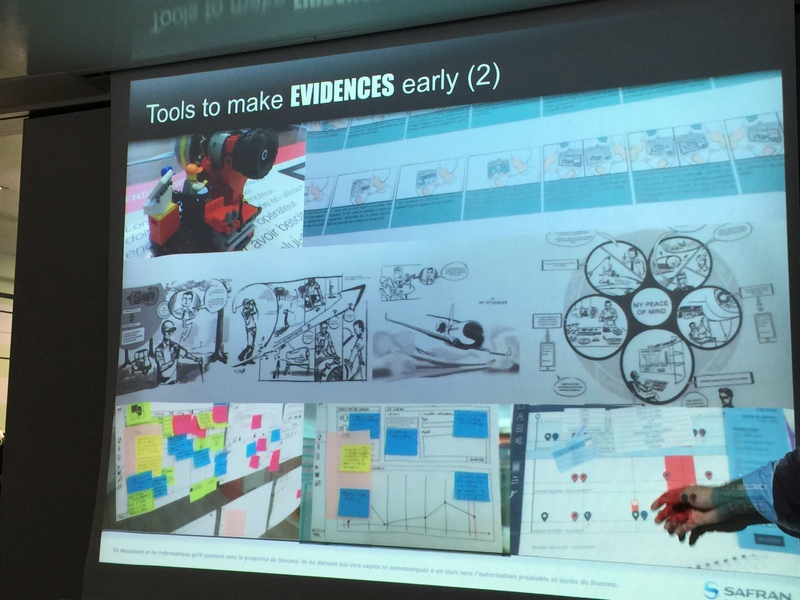 Various tools bring evidence to the creative concept early: storyboards, interface mockups, Technical Demonstrators, but also business model canvas, and Service blue print. The FabLab team is composed of 6 people. Service Innovation Factory FabLab gave birth to a Data Sandbox carrying works on Big Data, to a remote endoscopy project, letting you help the local operator who’s controlling the airplane engine, or to a tablet artefact with Microsoft. True makers and intra-preneurs are strongly supported, with bespoke training and prize. Exploring ideas potential contribute to create the future of services at Snecma. Usine.io is not a corporate FabLab, but it’s well worth the detour. It’s a tremendous space, a kind of heaven for Makers, and a bold businesss model. Usine.io is built on Tech Shop tracks, with a revisited commercial offering explains Gary Cige, one of the founders. It offers 1500 square meters of workshop, design and office space. It’s open to everyone (access upon monthly subscription between 100 to 450€), and everyone can be supported in its production by a dream team of 8 manufacturing, CAIO, electronic, milling,… expert trainers. 3 spaces are available: workshop, design, and offices / meeting rooms. 200 members have signed on, 70% of which are companies. Some teams are almost sedentary. Corporations send innovation teams for outcubation at Usine.io. Some come to work on the fly. Events occur frequently as the space configuration is amazing. 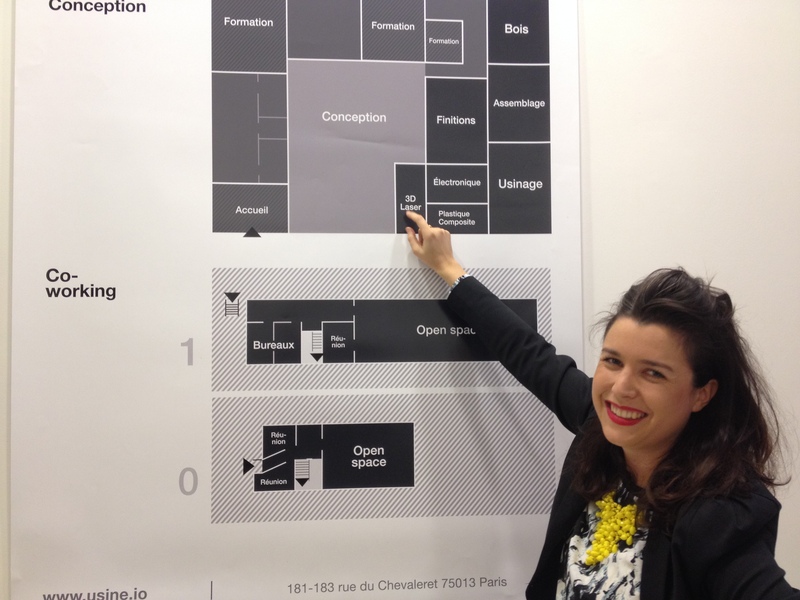 Agathe Fourquet, co-founder of Usine.io, gently took me for the tour of the house: below she shows us the map of the various spaces. Some familiar successful projects were coached at Usine.io: a drone camera, a medical navigation system, and the light Electric Mood scooter. Gregory Olocco is I-Lab director at Air Liquide. We had the chance to visit his great facilities previously. Today he focuses his presentation on the search of new business. 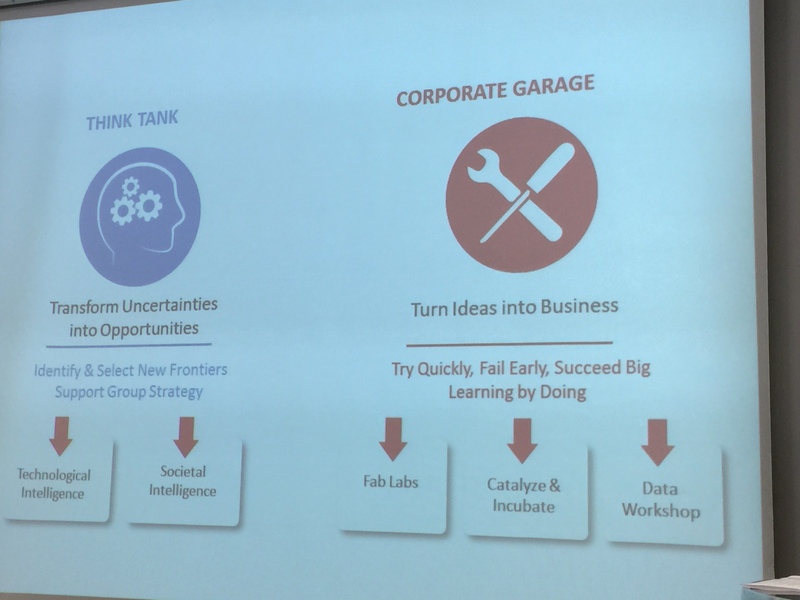 I-Lab is an agile and accurate structure that helps Air Liquide to move from a geographically-based growth to a new complex world, where threat and disruption can appear every day. Forecasting the future, detecting the challenges it holds, and the lands of opportunities it unfolds, leveraging Air Liquide strengths and legitimacy: this is the mission of the Think-Tank and the mid-term tasks. 2 new frontiers have been selected out of 6 domains: breathing in the city, and responsible food. From now on to the ultimate target, I-Lab is paving the way step by step, starting with start-ups incubation and innovation & design contests related to the air quality domain. I-Lab is a center of innovation: its 25 resources are here to innovate, and create value in a dual tempo, being jointly predictive and opportunist. going against the consensus view, speaking of usage and not IP, or tech.